When she was just five-years-old Elan wanted to help her friends and teachers understand her cerebral palsy. So the little girl wrote a book, explaining what her life was like and the challenges she faced. "Everybody was asking me questions...but by now I have got pretty used to it," said Elan, who is now nine and an aspiring mathematician. Her mother, Ceris Williams, now wants to see the book used in schools across Wales to help other disabled children. "When I was younger I had problems because I wasn't allowed to go in an electric wheelchair back then so everybody was fighting over who would push me around," said Elan, who lives in Cynwyd, near Corwen in Denbighshire. So she decided she wanted to make a book to help other children understand she was just like them, and let teachers know it was okay to talk about it. Now she wants to help children of all disabilities to be able to explain their conditions in a similar way. "It was stuff like pictures about different disabilities, information about how my limbs are affected and how autistic people's minds work differently," said Elan, who told BBC Radio Cymru she wants to compete in Paralympics. "They found it quite interesting and did have a few questions about physical stuff." 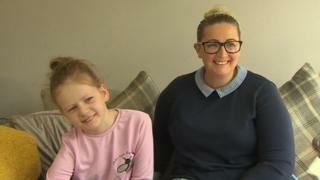 While Elan had a positive experience at her mainstream school, Ysgol Bro Dyfrdwy, her mother said this was not the case for all disabled pupils in Wales. "Things have been very natural for Elan in school and we would like every school in Wales to be like that in the way they have supported us really," she said. "Now that's not the case everywhere in Wales, and especially with hidden disabilities it is a lot more difficult." Ms Williams called for a more open and honest discussion when it comes to disability and wants to see the book used as a starting point to help people understand better. "Elan is quite proactive about her disability and will often tell people about it before they have asked," she added. "In places like America and maybe other places in the UK, they come along with a booklet about themselves explaining the challenges they experience during the day and how they can get over that. "I think it is important for parents to talk to their children about other children with disabilities."